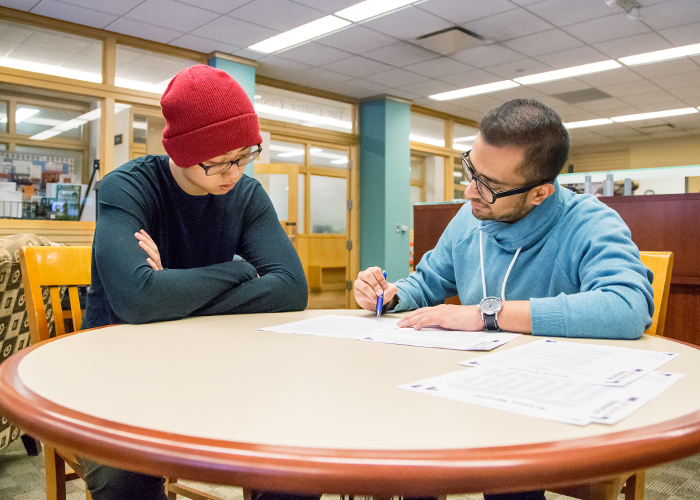 Yanchen Shi (left), a senior in bioengineering from Dunlap, Illinois, gets his resume reviewed at The Career Center by Rameez Siddiqui, a student paraprofessional there. Yet for many freshmen and sophomores, it’s not even on their radar. Graduation, after all, can seem a long way off. And many may feel unsure about their major and their future career plans, or how the two might connect. But The Career Center is there to serve freshman and sophomores – especially those seeking direction – as much as it serves juniors and seniors seeking jobs, said its director, Gail Rooney. Career decision-making, however, is a process, Rooney said. “There are some steps to it. It’s not just random.” Students can take those steps with help from Career Center staff, she said – free of charge, in confidence and without judgment. For both the certain and uncertain, The Career Center offers hands-on or online help, and often both – whether it’s figuring out a major, determining how it fits with a career (liberal arts included), evaluating a student’s interests and skills, advising on how to write an effective resume and cover letter, finding an internship, finding paraprofessional work on campus, preparing for a campus career fair, researching employers, preparing for graduate school or lining up interviews. Yet many students early in their college careers, even those confident of their direction, don’t seek out The Career Center because they think they just don’t need the help yet, according to Amanda Cox, an assistant director. “They don’t realize that there are things that they could be doing as first- and second-year students that will help them later on,” she said. Parents may not realize that the career services available today at Illinois are different from the placement services that were common in the past, Cox said. The approach is much more developmental, focused on preparing the student for career success, rather than just helping them to find that first job. And the services are more extensive. The most basic thing a student can do early in their college careers, Rooney and Cox both advise, is just getting involved beyond the classroom. Find a part-time job, join a student organization, do a service project. Find things they enjoy doing, as well as maybe things that stretch them. “Students need to learn about themselves, what they’re good at, what they would like to attain or achieve,” Rooney said. Getting involved in the campus community or in a job helps them do that. Better yet, those experiences build a resume, even if they’re not yet sure what they want to do. Even entry-level jobs like working in a restaurant, Rooney said, can demonstrate and develop skills and attributes that employers say they are looking for: communication, teamwork, problem-solving and critical thinking. Rameez Siddiqui, a junior from Hanover Park, Illinois, is one of The Career Center’s student paraprofessionals. In resume reviews, Siddiqui talks to many students who fear their accomplishments are lacking, or that employers may find them irrelevant. Staff members also make presentations in many first-semester seminar classes for students in various majors, and often help review the resumes that many students in those classes are required to write. Adding to this outreach is a program started by Cox last spring called “Don’t Cancel That Class.” In cases where a class might otherwise need to be cancelled, the program can instead provide a career-related workshop. Cox estimated that they conducted about 400 workshops last fall alone. Cox also works with various academic units to set up presentations and workshops for their students. The Career Center also keeps a full calendar of sessions on various topics, starting early in each semester, and all students are free to drop in. Among the topics: finding internships, writing resumes and cover letters, career fair prep, career fair prep for LAS majors, owning your own business, interview tips, federal government careers, networking, and building transferable skills. Along with those sessions, the center offers mock interviews, as well as many drop-in times for reviewing resumes and cover letters – most of those at the center itself, but also at other locations on campus. Many of the sessions and much of the resume review is done by trained career center paraprofessionals like Siddiqui. In the 2013-14 academic year, the center did over 3,600 of those reviews, and paraprofessionals were responsible for more than 90 percent. Siddiqui, majoring in community health administration, applied for the paraprofessional program last spring. “I was looking for a job where I would be professionally and academically challenged and rewarded,” he said, and the job has done that, aiding his career development in the process. He has improved his communication and teamwork skills, and learned about the many different career services across the campus. As a result of that, he wants to tell students, “Do not be afraid to ask for help,” because there is a lot of it available.